There are other occasions that may call for a nice holiday cheese basket, such as a thank you gift, housewarming party present, hostess and party attendee gifts, corporate “thank you’s” and “just because” gifts that make someone feel extra special on an otherwise average day. 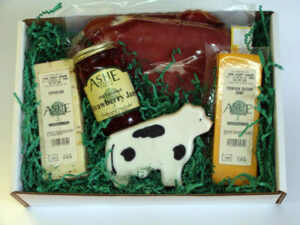 Everyone loves Ashe County Cheese! Our history factory has been creating delicious cheddar and other varieties of cheese including cheese curds, hoop cheese and specialized varieties like Habanero Cheddar for decades. We began offering holiday cheese gifts online to our clients and best customers that wanted to send some of our savory cheeses to those that had fallen in love with our cheeses after visiting our factory located in the pristine Blue Ridge Mountains in a quaint, historic downtown area of West Jefferson, North Carolina. We quickly realized that people everywhere just can’t get enough of our cheeses. We ship them all over the United States!